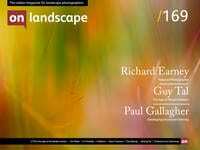 Richard is a designer and abstract landscape photographer living in North London. He uses a variety of cameras and a scanner to create his imagery. He’s happiest outdoors enjoying the landscape, but also when striving to find the abstract and unusual that’s out there. For the past couple of years, our social media feeds have been enlivened by Richards’s strange creations, the result of one of those happy accidents. His Warped Topographies do indeed show that we can all learn from mistakes, and also that we should not be too hasty in throwing away or deleting images that at first sight are ‘rejects’. Richard wrote an article for On Landscape in April 2017 about his experiments with out of date film and a faulty Polaroid camera, and how these had inspired him to research both the history and significance of Polaroid and the chemical composition of the films. Now, with a Fellowship of the Royal Photographic Society and a book which quickly sold out its first edition, we thought we’d catch up with him and talk about his adventures and where these may take him next. Would you like to start by telling readers a little about yourself – where you grew up, your education and early interests, and what that led you to do as a career? I was born in Old Windsor but grew up in Ealing, West London. I also went to University in London, which considering my love of the outdoors was probably a mistake location-wise, but I did meet my wife via that route, so it was a good thing! I grew up being curious and interested in the natural world and the landscape, although I knew more about the former than the latter. My degree was in Politics and Government, although my real love was (and still is) Economics. However, I became disillusioned with Politics (the subject) after my degree and started on a path to become a Graphic Designer. I have since worked in publishing as a book cover designer, a web designer, an app designer (my claim to fame there being that I designed the Shazam app), and I’m currently a User Experience designer.